This heifer calf has been bred for big body and lots of horn. Tempter, ZD Kelly, and Feisty Fannie. All 4 of her grandparents are in the 80s. 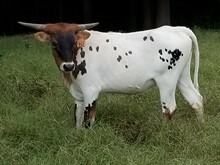 She will be a good cross on our new Loomis bulls. Heifer calf at side sired by LAR Hash Tag Tuff.